Brooks Brothers has sale items for up to 60% off. Take an extra 20% off in the cart, no code needed. Shipping is free on orders of $250+ or free shipping on $25+ purchase via ShopRunner. Deal ends 3/19. Brooks Brothers has sale items for up to 60% off. Take an extra 25% off in the cart, no code needed. Shipping is free on orders of $250+ or free shipping on $25+ purchase via ShopRunner. Deal ends 3/19. (Today Only) Brooks Brothers Offers 25% Off 2 or More Regular Priced Women's Collection Styles. Shipping is free on orders of $250+ or free shipping on $25+ purchase via ShopRunner. Brooks Brothers has 50% Off Men's Sport Coats & Merino Sweaters. Valid 2/20/19 - 2/25/19. Shipping is free on $25+ with ShopRunner. Brooks Brothers has Men's Suit Sale for $599. Shipping is free. Offer valid online and in store through Feb 19. Brooks Brothers is having up to 70% off online flash Sale. Shipping is free on orders of $250+, or free shipping on $25+ purchase via Shoprunner. Today only! Brooks Brothers has clearance items for up to 60% off. Take an extra 25% off at checkout, no code needed. Shipping is free on orders of $250+, or free shipping on $25+ purchase via Shoprunner. Deal ends 2/5. Brooks Brothers has clearance items for up to 60% off. Take an extra 25% off at checkout, no code needed. Shipping is free on orders of $250+, or free shipping on $25+ purchase via Shoprunner. Deal ends 1/23. Brooks Brothers has 40% Off Outerwear, Up to 60% Off Clearance. Shipping is free with $250 purchase. Brooks Brothers offers four Brooks Brothers Men's Dress Shirts in a wide selection of styles (Forward Point Collar Shirt pictured) for $141.78. Shipping adds $12.95. That's $38.68 per shirt, $27 under our October mention, and a savings of at least $136. It's available in select neck sizes from 14.5 to 18 and select sleeve lengths from 33 to 37. Deal ends December 27. Brooks Brothers has Clearance items for up to 60% off. Take an extra 15% off at checkout (no code needed). Shipping is free on orders of $250+, or free shipping on $25+ purchase via Shoprunner. Brooks Brothers has Clearance items for up to 60% off. Take an extra 25% off at checkout (no code needed). Shipping is free. Deal ends 12/21. Brooks Brothers has Green Monday specials. Shipping is free with any purchase. 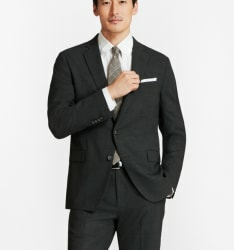 Brooks Brothers has 40% Off Men’s 1818 Suits. Price as shown. Shipping is free.